Every now and again I come across ideas and projects so worthwhile that I make contact with the people behind them. BBC Radio has been running a series “100 Women” and there were impressive broadcasts from Ghana and Uganda. Interesting things have happened as a result of me approaching people I hear on podcasts, see on line, read about in articles. Often I see myself as doing what Derek Sivers recommends in his famous TED talk as an under rated form of leadership, helping others who are doing great things. So I contacted both Tina and Rasheeda offering help, not just because I believe in so doing, but also because I want others to do likewise..
Tina send me a ton of information about what she is doing “Ghana Code Club designs step by step project guide for kids using scratch, HTML+CSS and Python. Most of the schools i volunteer in do not have access to internet nor projectors, (We’re working with the Parent Teacher Association in fixing these) until then, there’s no other option but to print out the project guidelines. Each project normally has an average of 15 pages, including challenges for the kid to try out before the next session.We’re using scratch to build a PAINT BOX for example this week, and this project has at least 18 pages, please find attached. There are not less than 100 kids in the first school that need a copy each of the guide, so your money will help print out projects for at least 150 kids, and we shall inscribe your name and logo on our websites as our supporting partner. We shall also establish good relationship with you as gestures like yours is a great honor to us. We’re continually seeking for funding each week for print outs alone until the schools we volunteer in get projectors and internet connectivity, getting the materials to the kids remain a challenge to us. Another area we need help in is getting our training centre together making it possible for the less privileged children to be taught for free. 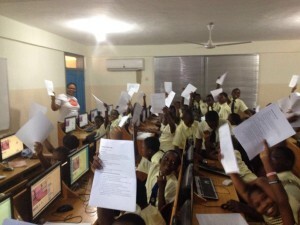 In Ghana, most government schools where the less privileged children are have no access to computer labs that are functioning. This remains a headache to some of us who are willing to help. Having our own computer lab can go a long way. We’ll need funding for rent, Computers, air conditioners, internet service, furniture, projectors setting these up. If this can be achieved, the sky is the limit. We are also looking for funding to get our back office together on our website where we can pack training materials including video for volunteers. So you see …. immediate funding and future funds will go a very long way. Ghana Code Club is a digital fun club that is designed to be led by volunteers or ICT teachers in elementary schools all over Ghana, led by trained volunteers or ICT teachers. The club begins after regular classes are over for 2hours or less once in a week. We initiated such a program because currently, there is little or no digital making activities in elementary schools in Ghana, meanwhile the world is revolving with technology. It is our aim that as children goes through the coding projects and challenges that come along with the project, kids’ interest in technology will grow causing them to participate and patronize other digital making in the future so that we can have a lot of innovators, entrepreneurs and critical thinkers. The Ghana Code Club began in August last year during the summer vacation school at the Hillview Montessori School in Accra, where I, (the founder) volunteered to teach myself using Scratch programming software. 80 kids between the ages of 8-14 started but after the regular school resumed, the number of kids tripled to over 240 forcing us to split the class into groups. Currently, there are 2 computer labs at the Hillview Montessori School. One has a sitting capacity of 30 and the other has 60. And so each week, we have 3 sessions. I supervise groups 1 and 2 with 2 other volunteers and group 3 is supervised by the ICT teachers who are happy to share in our vision and have been trained to become volunteers of the code club. On other days, we visit 4 other schools where we are repeating the same procedure as we do at the Hillview School. Unfortunately the other schools do not have more than 40 computers and so we are forced to limit the number of kids who are willing to join the club. We have designed projects in Scratch, HTML+CSS and Python languages. We start with the basics of scratch language where kids are thought to explore to obtain the basic principles in programming. Currently out of all the 5 schools we visit, only one school, University Primary, Legon that has necessary infrastructure to make learning easy in place. We have quite a challenge with power outages in the country until January 2016, when power cuts have slowed down a bit. When power cuts off, we need to close our session and the kids may need to take their step by step project printouts home to continue without our supervision. We also have a big challenge when it comes to screening videos that can empower the kids even more. This is because 4 out of the 5 schools do not have projectors. This makes supervision so tedious considering the number of children involved in each session. Anytime we start a new project, we hold our laptop and move about showing the kids how their finished project should look like. Ghana Code Club requests for support to be launched out formally once our back office is ready to serve as training resources for volunteers. We need funds for storing the resources including video tutorials. We intend to invite technology institutions and the minister of education in Ghana to help us outdoor this initiative into all elementary schools in Ghana..
We need funds to be supporting our day to day runnings. Transportation, airtime, electricity bills, Project guides and volunteer meet-ups. We need a projector with accessories, Printers and photocopiers and one laptop. We also want to establish our own computer lab where other activities can take place. Some children from the government schools where there are non functional computer labs can attend our sessions on weekends. We can train others who are willing to pay to ease our day to day expenditure. Of course I want to help, and others to do so as well. I informed contacts in Google and Astia about what they are doing, and I introduced Tina to Emmanuel Leslie Addae Curator of TEDxAccra – with whom I made contact having figured out that her story and project might be worthy of a TEDx talk. They have yet to meet. 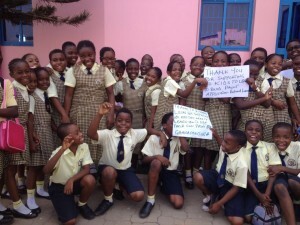 Perhaps more publicity and introductions can help Ghana Code Club find deeper pockets than mine and encourage other people to do similar projects in other schools, towns and countries. 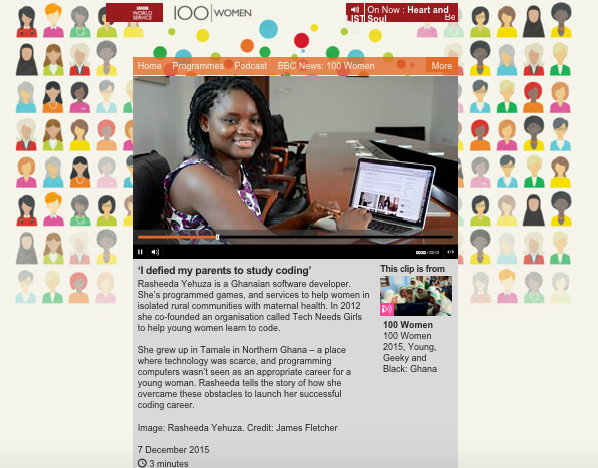 Rasheeda Yehuza’s project ” Tech Needs Girls” is also looking for partnerships. she wrote “Tech Needs Girls would be excited to explore a collaboration! A donation would really help propel our activities as we scale country-wide, and an introduction to the Polish coding community will be fantastic.” I haven’t found a partner for her yet. but am looking around. The idea worth spreading in the above experience is that it is worth trying There is nothing to stop anyone reaching out to anyone anywhere. Google and Twitter make it so easy, and finding out what you can do to help. It’s my belief rather than a proven fact that my approaches in these cases was the right one. I know that it is too early to tell. If the only benefit is that of my donation, then the gift without any associated PR could be enough. The test of whether it was worth going my public with introductions and posts like this will be whether over the next few months, other positive things happen as a result. This story at the time of writing- 24th January 2016 – is a work in progress. I’ll update in a few months. The fact that some offers of help have not led to anything is important to note as well. If you don’t try to do anything you won’t fail, but of course you can’t succeed either.. As J. K. Rowling says in her wonderful Harvard Commencement talk a life lived without risk of risk of failure is hardly worth living at all.